Port Royal Historic Site, near Annapolis Royal. A Nova Scotia winter is enough to chill even the hardiest soul, even more so 400 years ago when conditions for the early colonists were spartan. But at Port Royal, in the winter of 1606-1607, French explorer Samuel de Champlain came up with a unique way of getting through those long, dark months: The Order of Good Cheer. Every few days, supper became a feast and one man was responsible for ensuring all his guests were well taken care of. In this way, they hoped to reach spring in good health and good spirits. As you walk through the collection of simple, wooden buildings that make up the site, you can imagine de Champlain and his men, along with Mi’kmaq chiefs and local inhabitants feasting on everything from moose to beaver, washed down with a good measure of wine. 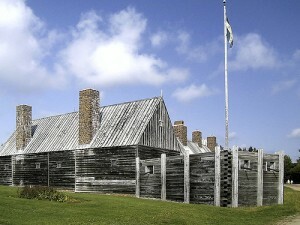 Port Royal’s wider history spans the years from 1605 to 1613, when the French were trying to establish a foothold in Canada. Many of the early arrivals died from exposure and poor nutrition. Less than 10 years later, England had the upper hand in the race to win control of the new world and in 1613 Port Royal was burned to the ground after ana order to expell all Frenchmen from the territory. Directions: Port-Royal is just a short drive from Annapolis Royal and Granville Ferry. If you’re coming on Highway 101 from Halifax or Yarmouth, take Exit 22 and cross the causeway to Route 1, then go left following signs to Port Royal. Admission fees: Adults $3.90, Seniors $3.40, Children $1.90, Families and Groups $9.80.